[phi,w] = phasedelay(sysobj) returns the phase delay phi of the filter System object™, sysobj, based on the current filter coefficients. The vector w contains the frequencies (in radians) at which the phase delay is evaluated. The phase delay is evaluated at 8192 points equally spaced around the upper half of the unit circle. [phi,w] = phasedelay(sysobj,n) returns the phase delay of the filter System object at n points equally spaced around the upper half of the unit circle. [phi,w] = phasedelay(sysobj,Name,Value) returns the phase delay with additional options specified by one or more Name,Value pair arguments. phasedelay(sysobj) plots the phase delay of the filter System object sysobj in the fvtool. For information on more input options, refer to phasedelay in Signal Processing Toolbox™ documentation. Number of samples. For an FIR filter where n is a power of two, the computation is done faster using FFTs. Specify the arithmetic used during analysis. When you specify 'double' or 'single', the function performs double- or single-precision analysis. When you specify 'fixed' , the arithmetic changes depending on the setting of the CoefficientDataType property and whether the System object is locked or unlocked. Phase delay vector of length n. If n is not specified, the function uses a default value of 8192. Frequency vector of length n, in radians/sample. w consists of n points equally spaced around the upper half of the unit circle (from 0 to π radians/sample). If n is not specified, the function uses a default value of 8192. You can provide fs, the sampling frequency, as an input as well. 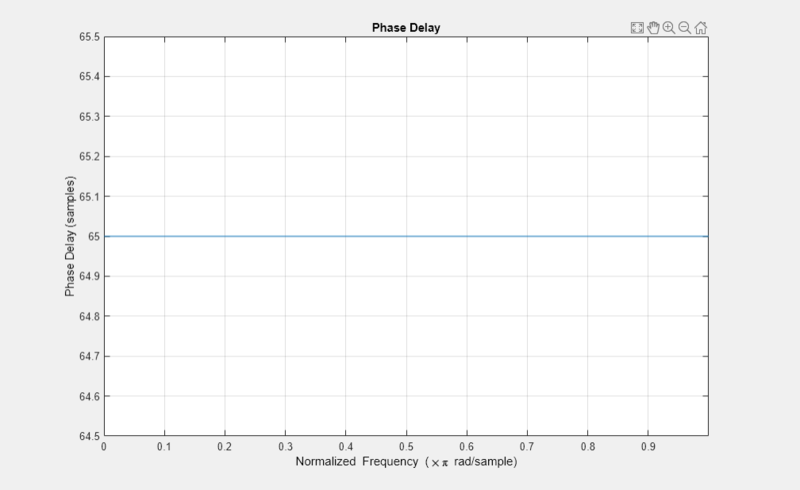 phasedelay uses fs to calculate the delay response and plots the response to fs/2.